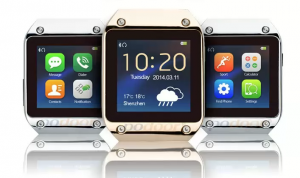 The smart watches are trendy and all major manufacturers are launching devices on the market. The possibilities are enormous and we can find from quantifier bracelets as the Fitbit, the LG Lifband Touch, or the SmartBand SWR10 form Sony, and all kinds of smart watches, whether notifiers, like the Gear 2 or Sony’s Smartwatch2 or independent devices such as the Kreyos Metor. However, a common denominator is the price. While bracelets have an acceptable price for most pockets, smart watches are another matter, and in many cases the price easily exceeds $250. Like with any other device, Chinese manufacturers have decided to take active part in the race and make their own smart watch at a very competitive price. 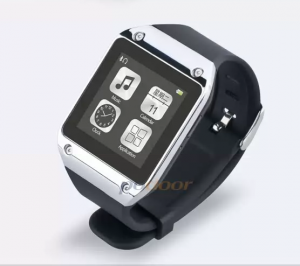 The result is the SmartWatch PW35, which belongs to the Poodor catalog and it is sold by w2comp. Aesthetically, it is a clone of the Galaxy Gear. It follows the same design as the Samsung smart watch, but inside they are completely different. The PW305 has a 1.54-inch TFT color touch screen with 240×240 pixels resolution. It uses a MTK6250 processor and so far it only includes two languages: Chinese and English, though the company claims that in new updates they will include more languages. It works with its own version of Linux and it is able to connect via Bluetooth to smartphones with Android operating system. It has an internal battery rechargeable via USB that endures 2-3 day of intense use. The screen has a considerable level of brightness, and we can adjust it for a perfect viewing outdoors. The menus are intuitive and it’s easy to navigate through them by moving our finger horizontally to change between menus and vertical to go back. We have a physical button to turn on and off the screen, and return to the start menu. To configure the smart watch, we just need to install an app on the phone and the watch will work as a second screen for our smartphone. We can make phone calls, and also answering the incoming ones. Both the speaker and the microphone built into the watch provide good sound quality during a call. When we have new messages, we receive a vibrating alert, and we can read and respond to any message directly from the watch. The main screen displays the time, the weather and all the notifications we have configured through the phone application. There are two possible views for the menus, one with color and one with a more classic gray tone, saving battery. 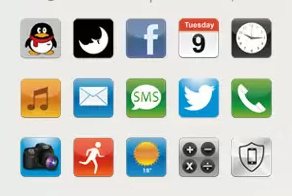 Among the applications installed with the phone, we can find the calculator, alarm, stopwatch, a warning system that we can activate to alert us when we move away from the phone, synchronize the contact list with the smartphone, etc. We can also control the camera through the smart watch, both to take pictures and to view the live image of the camera. Not forgetting the most typical features of the quantifier bracelets, the PW305 has a pedometer to quantify the steps and monitor our physical activity, providing the typical information about the distance traveled, the calories burned, etc. The PW305 is available in black-silver, black-gold, and orange-silver. You can buy this smart whatch for $112 at w2comp.